At State Bank, we know you deserve to have it all--banking conveniences, everyday savings, and peace of mind. Answer a few simple questions and we can find the best fit for your checking needs! Q: Do you maintain a minimum balance of $1,500 in your account? If YES, then PREMIUM CHECKING is the account for you! Our Premium Checking account is packed with great benefits! Shop Local, Save Local with the Bazing app! Overdraft Privilege* up to $500 could be available -- see details below! Q: Do you have a cell phone or look for details when you shop? We named our VALUE CHECKING account for a reason--it packs a lot of benefits for a low monthly fee! Overdraft Privilege* up to $400 could be available -- see details below! Q: Do you want a low cost account with basic benefits? 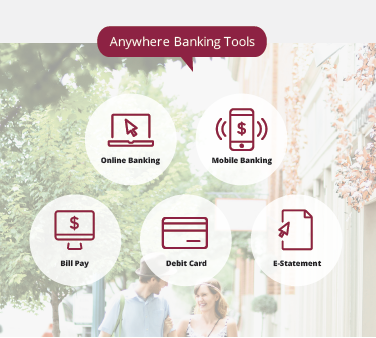 Our BASIC CHECKING account is simple and easy to manage. Maintain a $100 minimum balance, and we'll waive the $5 monthly fee. Additional $2 paper statement fee per month waived with choice of e-statement. Overdraft Privilege* up to $300 could be available -- see details below! 1Cell phone protection, personal identity theft benefit, and roadside assistance are subject to additional terms and conditions at BaZing.com. 2Insurance products are: NOT A DEPOSIT. NOT INSURED BY THE FDIC. NOT INSURED BY ANY FEDERAL GOVERNMENT AGENCY. NOT GUARANTEED BY THE BANK. 3Fee will apply if less than three bills are processed per month. 4Message and data fees may apply. Consult your phone carrier. *Customers of Chillicothe State Bank: $25 fee for all overdraft and return item fees except one time point-of-sale transactions and automated teller machine (ATM) withdrawals. Any and all overdrafts including overdraft charges and returned check charges are payable and due upon demand. Categories of transaction which may be presented for payment and be imposed a fee are transactions created by check, in-person withdrawals or certain electronic means. Whether the overdraft is paid is discretionary and we reserve the right not to pay an item. We typically do not pay overdrafts if your account is not in good standing and you are not making regular deposits to your account. You must bring your account to a positive balance (not overdrawn) at least once every thirty (30) days. If your account has the Overdraft Privilege Program available, you will have a maximum of $150.00 per day in Overdraft Fees. *Customers of State Bank of Missouri: $30 fee for all overdraft and return item fees except one time point-of-sale transactions and automated teller machine (ATM) withdrawals. Any and all overdrafts including overdraft charges and returned check charges are payable and due upon demand. Categories of transaction which may be presented for payment and be imposed a fee are transactions created by check, in-person withdrawals or certain electronic means. Whether the overdraft is paid is discretionary and we reserve the right not to pay an item. We typically do not pay overdrafts if your account is not in good standing and you are not making regular deposits to your account. You must bring your account to a positive balance (not overdrawn) at least once every thirty (30) days. If your account has the Overdraft Privilege Program available, you will have a maximum of 4 Overdraft Fees per day. *Customers of The State Bank: $25 fee for all overdraft and return item fees except one time point-of-sale transactions and automated teller machine (ATM) withdrawals. Any and all overdrafts including overdraft charges and returned check charges are payable and due upon demand. Categories of transaction which may be presented for payment and be imposed a fee are transactions created by check, in-person withdrawals or certain electronic means. Whether the overdraft is paid is discretionary and we reserve the right not to pay an item. We typically do not pay overdrafts if your account is not in good standing and you are not making regular deposits to your account. You must bring your account to a positive balance (not overdrawn) at least once every thirty (30) days. If your account has the Overdraft Privilege Program available, you will have a maximum of $100.00 per day in Overdraft Fees. No matter your savings goal, we can help you start savings today.